Good morning darlings! I am excited to bring you today's review, I have been testing out Exuviance's Illumination Duo for some time now and have really been loving the results! This duo combines the power of our nighttime transformer, Evening Restorative Complex, with the 100% pure active formulation of Vitamin C+ Antiaging Booster for a potent antiaging cocktail that combats the visible signs of aging. 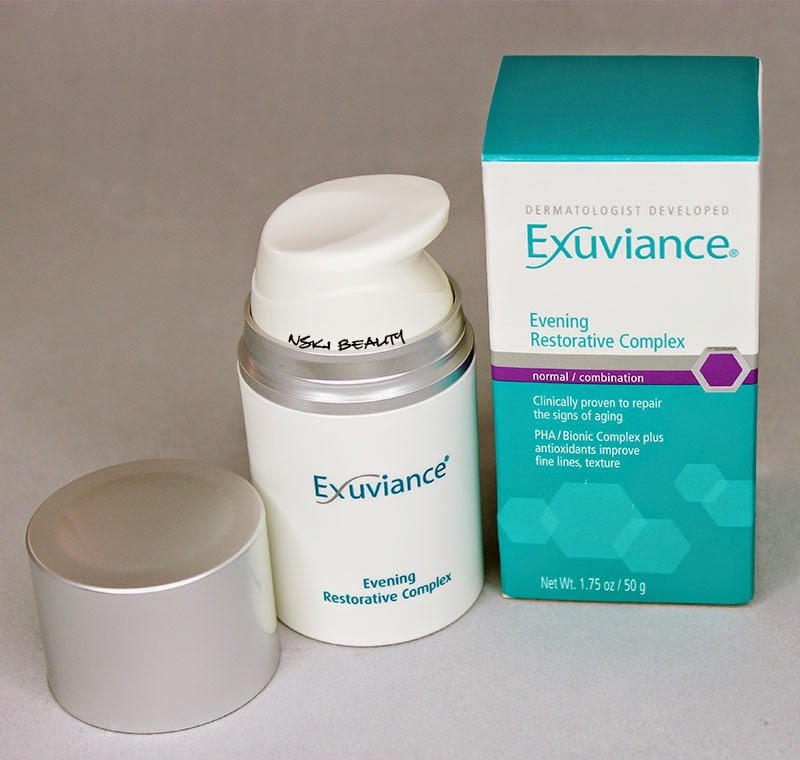 Exuviance Evening Restorative Complex is clinically proven to improve overall skin texture, tone, and appearance. 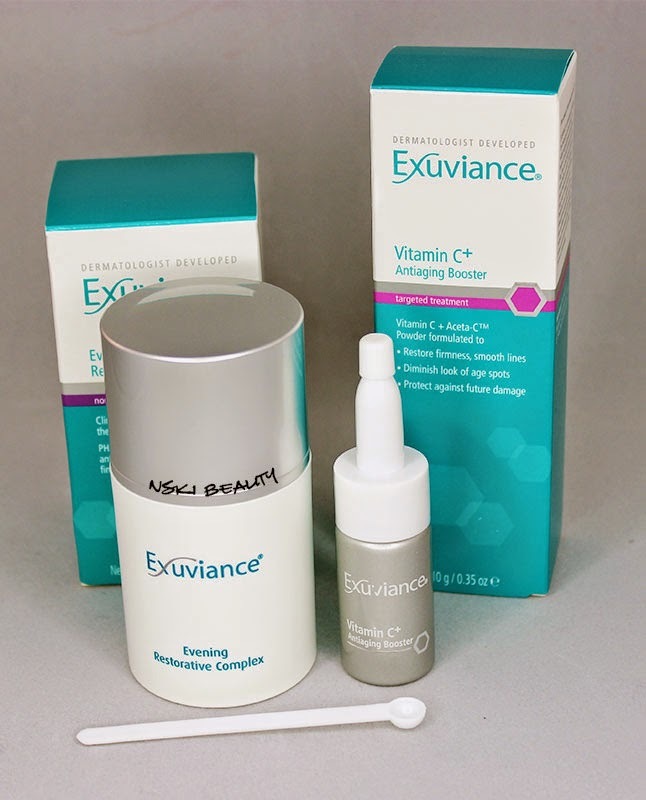 Exuviance Vitamin C+ Antiaging Booster amps up the effects of the Evening Restorative Complex, helping to fade the look of dark spots while improving skin firmness and smoothing texture and wrinkles. Starting off with the package design for the products I like how clean and simple the packaging is while still supplying you with details on each product. The Evening Restorative Complex which I applied at night (obviously LOL) is a rich cream that feels fantastic on your skin and added an aura of pampering after a long day of work. 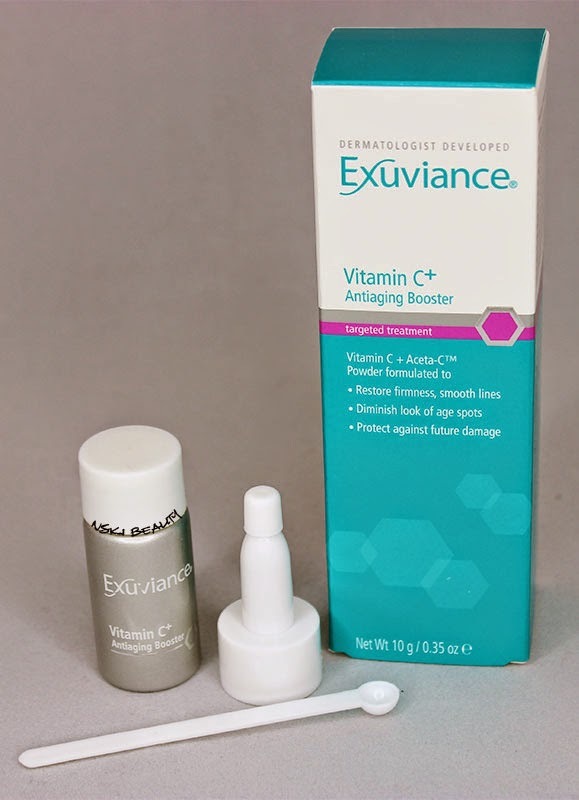 I always added a few shakes of the Vitamin C+ Antiaging Booster which I found a bit difficult to get the product out. Not that the product was compacted so bad it wouldn't dispense but the instructions say not to exceed more than three shakes or half a scoop as the Vitamin C+ powder can be potent. And with already having a pump of the Restorative Complex in my hand I never opted to use the scoop so I always just finagled with the Vitamin C+ powder till I had the correct amount. 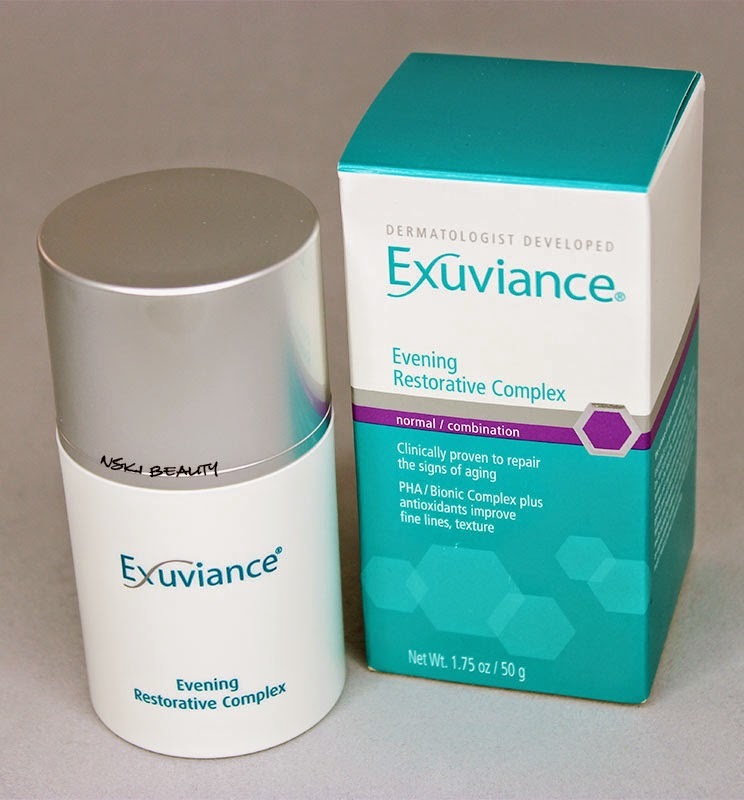 I used the Exuviance Duo for a total of four week and never experienced any irritation from the product which was nice because I tend to have sensitive skin. I also noticed that my skin started to even out and my enlarged pores on my cheeks started to diminish in size which was a super happy plus for me! I really enjoyed this product and the results I achieved the only thing I didn't like was trying to get the Vitamin C+ powder out. 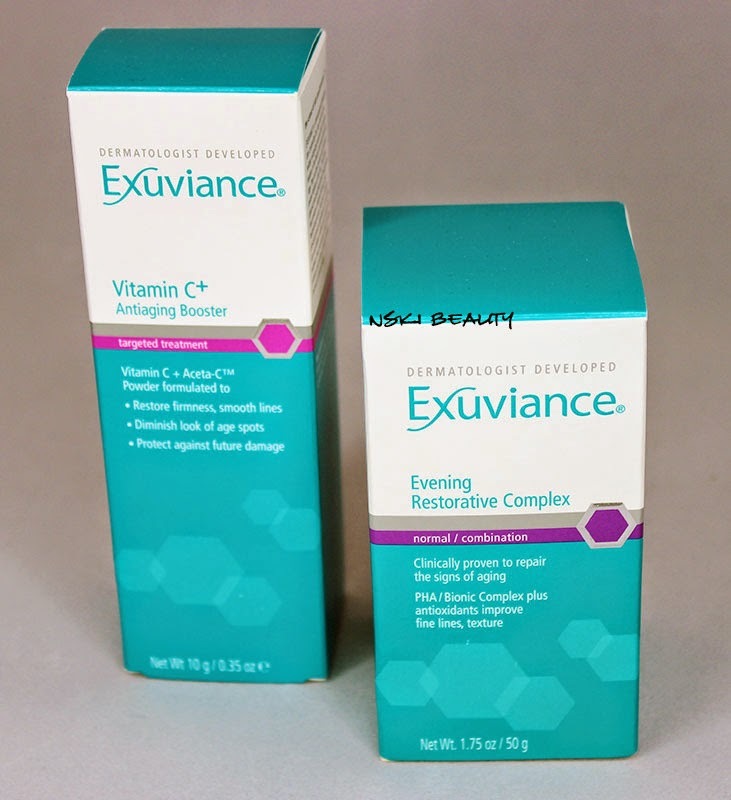 The other downside to the product for some could be the price, suggested retail price is $120.00 but if you click HERE you can purchase it direct from Exuviance for only $77! Disclosure: Compensation was provided by Exuviance via Brandbacker. The opinions expressed herein are those of the author and are not indicative of the opinions or positions of Exuviance. Sounds like a product that gets results! I want myself some of that vitamin C antiaging booster, looks great! Looks like a great skin care line. I could use some anti aging products. This sounds awesome. I need something to help with my pores. Thanks for the review! That is a bit pricey. I know that it would not fit into my budget. Glad you found that it worked for you. Sounds like a great product as I age. What a great discount! Sounds like it really gets amazing results!